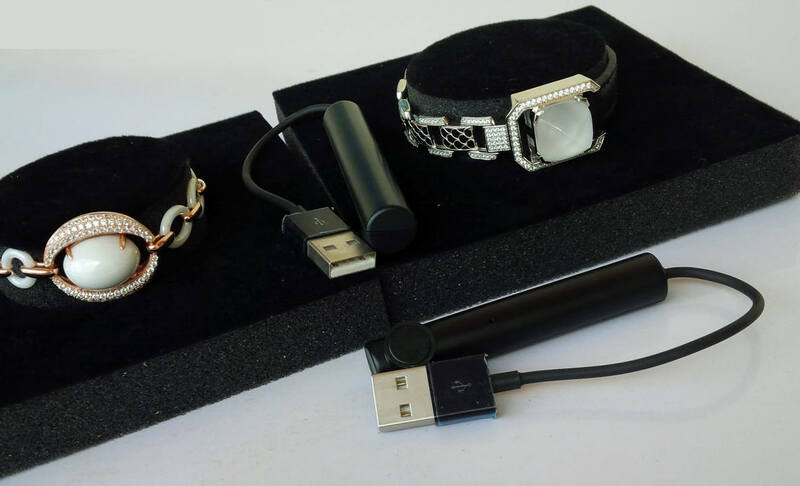 Wenwen Smart Bracelet is a unique jewelry package from Guangzhou Wenwen Technology Co., Ltd. This little piece of tech interacts seamlessly with iPhone, Android and tablet devices with the help of a mobile app. 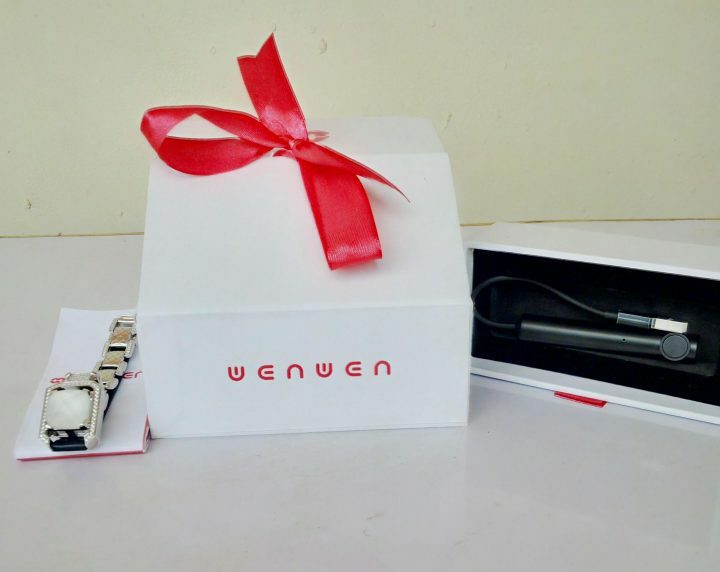 In this detailed Wenwen smart bracelet review, We’re going to introduce the gadget, list its functions, the app features, over-all performance and a “how to use” guide for early adopters. Wenwen smart jewelry is a sociable bracelet that communicates seamlessly with phones and/or smart devices. The tech team at Guangzhou Wenwen Technology Co., Ltd. came up with this innovative product. It is targeted at couples/lovers as it normally comes in pairs. Wenwen smart bracelet chip is made of ceramic zircon and have support for iOS and Android devices. There’s a Bluetooth 4.0 tech for wireless communication and a magnetic tight coupling USB charger for fast charging. 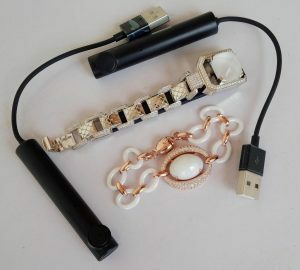 The bracelet is powered by a 10mAH rechargeable battery with a charging time of 40 minutes (or less) and 10 days standby time. We received this unit from Wenwen tech PR team and have used same for more than a week already. Wenwen smart jewelry packaging is premium. The Eric and Joy boxes are packaged separately and can be opened individually once removed from the carton. The box design is colorful, with magnetic components around the edges. A magnetic tight coupling USB charger. User manual with English and Chinese version. As earlier described, Wenwen smart bracelet is primarily designed for couples. The one termed “Erick” is for the male, while the one with “Joy” tag is for the female. Both are impressively IP68 water/dust resistance and designed distinctively to fit either of the couples. Erick is a leather strap with masculine build while Joy is built with feminine features. They work the same way, but serves better when they are paired. This is because the mobile app comes with interactive features such as “sweet words”, “memory album”, “I want to confess” and similar couple’s game. So far, the performance of this magic jewelry is been nothing short of awesome. I mean for a 10mAH tiny device of this sort to standby for so long without shutting down is quite impressive. The response rate is also good. I tested this by playing the flying kiss game that came with the app. My only disappointment however is with Erick’s steel band. It doesn’t have an adjustable pushpins to resize the wrist strap. I feel very uncomfortable with it when on outings. Coming down to the features, I’ll like to rate their app developers 5 star. They really did a good job with the mobile app features. Everything works as supposed. Here’s some of the popular features of Wenwen smart jewelry. Romantic Interactions: Relationships gets more interesting when there’s time for fun and/or romantic games. Wenwen smart bracelet lets you send love text message, Secret love videos, romantic audio and etc. to your partner silently. The jewelry would vibrate or flash once such message is sent. There’s an option to configure notification settings for love messages. Sport & Fitness Features: Wenwen smart bracelet let you burn calories with its steps counting tool. You can use this tool to track your daily fitness goals. Seamless integration with smart phones: You can take selfie by shaking your wrist, get notification for calls, messages and social apps, monitor your phone’s location and all that with Wenwen tech’s smart jewelry. 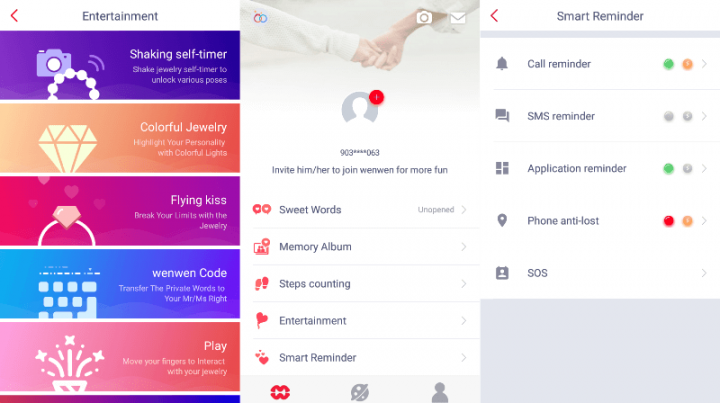 Game & Entertainment Features: apart from SOS, anti-lost and other core features of Wenwen mobile app, you can get entertained with Wenwen smart jewelry. There’s flying kiss, colorful jewelry, bar turnplate and other entertaining tools. The first step after unboxing is to charge for 40 minutes or thereabout and then download their mobile application from Apple iTunes store or Google play store (depending on your device). Sign up for an account using your primary cell phone number. Log in to the app interface and then pair up your phone with Wenwen smart jewelry by using the Bluetooth 4.0 function. Once paired and logged in, click on the human being icon to find profile options. Click on your profile to change regular options like: Nickname, avatar, relationship status, gender and etc. Go back to the profile page and click on my partner to add a spouse or a lover. You’re fully set. Go on to explore the features of Wenwen smart bracelet. For a product in its development stage, We’ll like to rate them highly. So far, we’re impressed with their design architecture, performance and build quality. Their mobile app is light, fast and intuitive. Being able to view the remaining battery life via the app’s interface is somewhat creative. This is because the jewelry comes with no screen. Everything is controlled via the cell phone app. We wished they came with an adjustable pushpins to resize the wrist strap to fit. Apart from this little flaw, everything else works as advertised. For more about Guangzhou Wenwen Technology Co., Ltd., their smart jewelries, patented tech and everything else; do visit their official website at wenwen-tech.com. the magnetic tight coupling USB charger design is impressive. the Anti-lost feature works and that’s a lovely addiction to the jewelry. the over-all design is innovative. The mobile app works flawlessly on Android & iOS devices. User can’t resize the wrist strap to fit. The strap clip on Joy looks frail and shaky.